This video must be joke right? 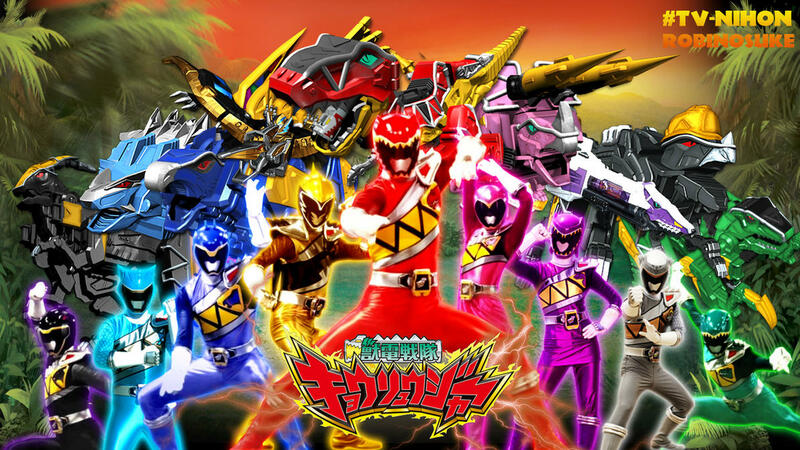 So why that Zyuden Sentai Kyoryuger have English name is Power Rangers Dino Charge show up so early on next year 2015 after Super Megaforce in America? But what about Tokumei Sentai Go-Busters next year 2015 after Super Megaforce with English in America? It's definitely no joke. It seems like they skipped Go-Busters to use Kyoryuger. Kyoryugers looked more like Power Rangers than Go-Buster anyway. I'm looking forward to this. Not only that, Kyroyuger is the only Sentai show without a yellow ranger. actually vgiannell that isn't true there have been sentai series in the past without a yellow ranger. 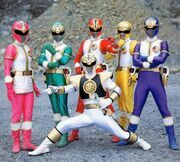 In Power Rangers history, Dino Charge will be the first team without a Yellow Ranger. Already? They already have info for season 23? We're still in the beginning of season 21 (Super Megaforce). Geez these guys move quick. So season 22 is Dino Charge and season 23 is Dino Supercharge? Interesting. I wonder what the opening sequence will be like. I have no idea why that Power Rangers Dino Supercharge already show on website. I think maybe just like Power Rangers Super Samurai and Power Rangers Super Megaforce something like that. Here's some info about POWER RANGERS DINO CHARGE. Lucas – Red Ranger is the 18 year-old leader of the Rangers. He’s curious, energetic, charming, and gregarious; a free-spirit who full embraces the idea that life is an adventure. While childlike at times, Lucas has the ability to switch on his serious side and his role as the Leader is unquestionable. Koda – Blue Ranger (The Caveman) 100,000 years ago, Koda lived in jungle cave with his tribe. Today, his caveman ways make him a fish-out-of-water, leading to some wonderful comedy. He eats with his fingers, doesn’t like to wear shoes, and sees no benefits in combing his fair. He isn’t the smartest Ranger, but he’s got a heart of gold, is fiercely loyal, and is as strong as an ox. His survival instincts are sharper than any other Ranger. Chase – Black Ranger is a cool and laid-back 18 year-old. He wears the right clothes, listens to popular music. He’s very handsome and receives a lot of attention from the girls. He gets around by riding a skateboard, while sporting a hoodie and ear buds. He spends his free time diddling on a guitar. Chase is very forgetful and is always late, stopping to flirt with girls, or responding to tests. Ryan – Green Ranger (Matt’s younger brother). He’s quiet, confident, and disciplined. At only 18 to look 16 years-old, he’s a bit smaller than the other Rangers, but just as fierce. Ryan grey up on a ranch, but didn’t fit in. Ryan practiced his sword skills. Fencing is just one of the unique things about Ryan, he doesn’t like to get dirty, he’s picky about what he eats, and he’s a whiz at logic games, like chess, checkers, and Rubik’s cube. Shelby – Pink Ranger is the rough-n-tumble 18 year-old tomboy who loves to get into the dirt. She’s strong-willed, stubborn, and direct, which makes dating a challenge…for the boy. She is clumsy and disinterested in all things that don’t involve dinosaurs or being a Ranger. Ivan – Gold Ranger (The Knight) 900 years ago, Ivan was a valiant, 18-year old knight. He’s a very gentle, kind soul who values honesty and loyalty above all else. He wields his magnificent sword with legendary skill and doesn’t hesitate to use it for noble cause. He’s always an ace with a bow and arrow. Ivan behaves with great finesse and chivalry. He speaks with a BRITISH ACCENT, and uses odd, antique phrases, continually clashing with today’s culture. Matt – Gray Ranger (Ryan’s older brother). At 18 years-old, he’s a cool and confident cowboy, complete with jeans, boots, and his favorite old hat. He’s warm and funny, with a charming wink. He grew up on a ranch and loves the outdoors. Matt is a bit old-school in his thinking. While he doesn’t quite understand Ryan, Matt’s sure that his job as an older brother is to protect his younger brother. Kiera – Purple Ranger (The Scientist) is a brilliant 18-21 year-old engineer whose discoveries have made her very rich. She is confident, direct, and rarely gets emotional. She has a serious demeanor and doesn’t make friends easily. Deep inside, she’s a bit lonely, and starts to learn the deeper meaning of friendship as she comes to respect and understand her Ranger family. She isn’t as forceful as a “commander”, but she’s more insistent than a friend. Not a problem, @PRThunder. I got the info from a friend on Facebook. actually kyoryuger only has 10 rangers in the main series. I now have a headache from reading so much info. I just hope we'll see all 10 or 9. That would break the record for most Power Rangers on the team... and it would be awesome. Let's just hope Saban will be able to provide a good 2 seasons. Samurai/Super Samurai only had a little Ranger spirit and Megaforce/Super Megaforce is Saban re-learning the way of Power Rangers. @PRThunder, you know that Saban will mess it up like he did with the adaptions of Shinkenger, Goseiger, and Gokaiger. @zeoranger5 I'll admit he made mistakes with them, but at least he's improving. Dino Charge may turn out to be good. Let's give it a chance.